Is 60 Minute Profit Plan A Real Deal? I’ve recently found one ClickBank product called 60 Minute Profit Plan that claims you can make over $30k in your first month. Is 60 Minute Profit Plan legit or is another scam? Despite 60 Minute Profit Plan sounds a little cheesy to me, but in order to give the program benefit of doubt, I decided to do a review. Get Inside 60 Minute Profit Plan – How It Really Works? Can you really make $30k a month with 60 Minute Profit Plan? Summary: This product is obviously packaged to give false impression to newbies that making money online is easy. It consists mainly training that you can find easily on the web for free. This course even sell you videos that are taken directly from YouTube. The 60 Minute Profit Plan claims to help people like you and me make money online. Income statements shown in the sales video give the impression that its students can “easily” earn up to $400k per year. You can see for yourself down here. The owner of this program is someone with the name Brittany Francis but I can’t find any details of this person on any social network at all. 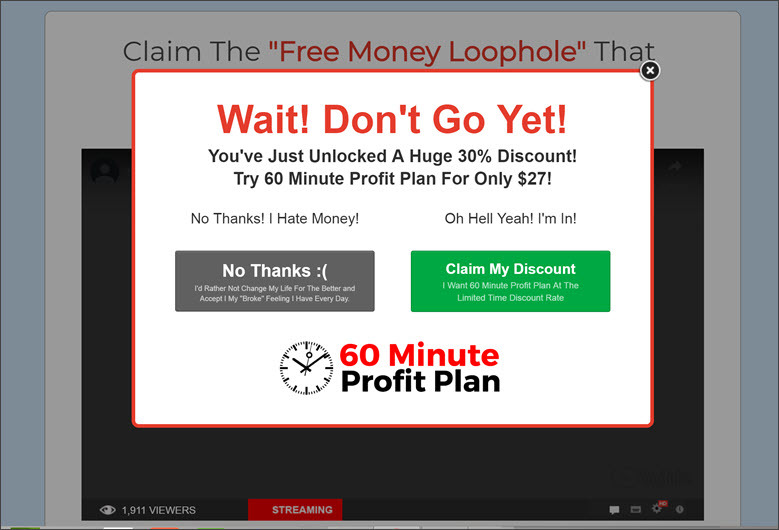 Sales video of 60 Minute Profit Plan is full of ambiguity. After I watched the 20 minutes video, I still don’t know what’s 60 Minute Profit Plan all about. Except there are many people managed to make tons of money following the plan. When I review products that fit into at least 2 to 3 of the suspicious characteristics mentioned below, it is my regular practice to do a search on all persons involved inside the sales page. If you ever find these characteristics, then I suggest that you do more due diligence on your part before buying. These are the characteristics that I feel you should be aware of. There’s a pop-up giving you unbelievable discounts when you are trying to close the browser. Based on my experience, these products are mostly low quality and not worth to buy. Let’s see whether my instinct is correct. 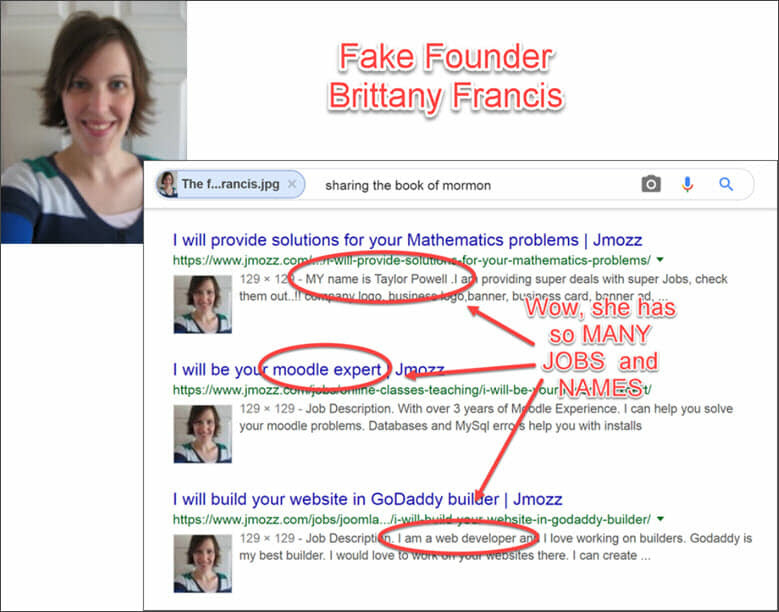 The self-proclaimed owner Brittany Francis has many jobs aka skills or expertise and even names when I did a Google image search. Inside 60 Minute Profit Plan, she is an experienced online marketer and her name is Brittany but in another website she became a mathematics expert with the name Taylor Powell. This person obviously does not own 60 Minute Profit Plan. She is just a model found inside some stock images. Brittany Francis is a FAKE Owner! So, let’s see what I can find about “Brittany’s students” who have made tens of thousand dollars with 60 Minute Profit Plan. The result shows the same. The picture below that shows “Gravson Parker” with a truck is actually a stock image. Don't think his name is even real. 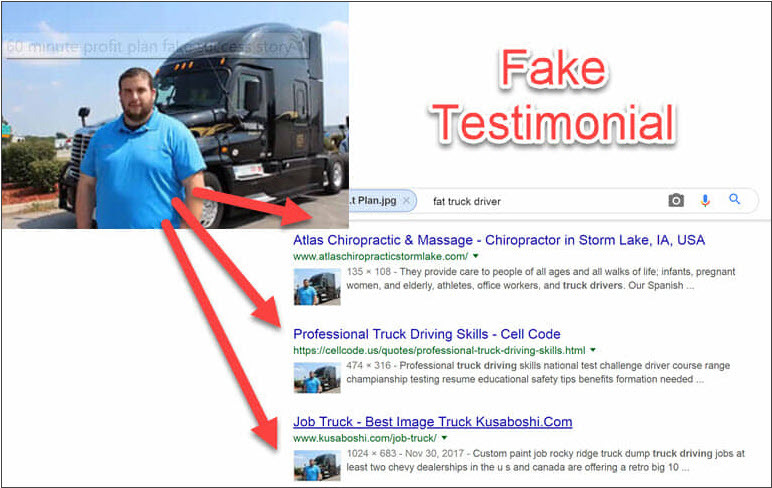 Other than being used inside 60 Minute Profit Plan, the image of this man in front of a truck was also used in most truck drivers & logistic websites. Without much effort, I also found out that Gina is a fake persona with a second name Vanessa. You can find her image inside stock images too. So am I right to conclude that everything is fake inside 60 Minute Profit Plan? If you not convinced yet, let’s move on to the next one that I am going to expose. Hey, this is the guy that gave testimonial inside 60 Minute Profit Plan. He is also the guy I always see inside Fiverr who sells professional spokesperson videos for a living. So are you now finally convinced everything is fake inside 60 Minute Profit Plan? Seriously, up to this point, I am just too lazy to continue exposing all those fake stuffs. It’ll be a waste of my time. If the owner is fake, what else can be real? Ok, maybe whoever the person selling 60 Minute Profit Plan is just starting out so he/she may think buying some testimonials can help to get started. To give the program a fair review, let me share with you what is inside members’ dashboard so you can make the right decision. 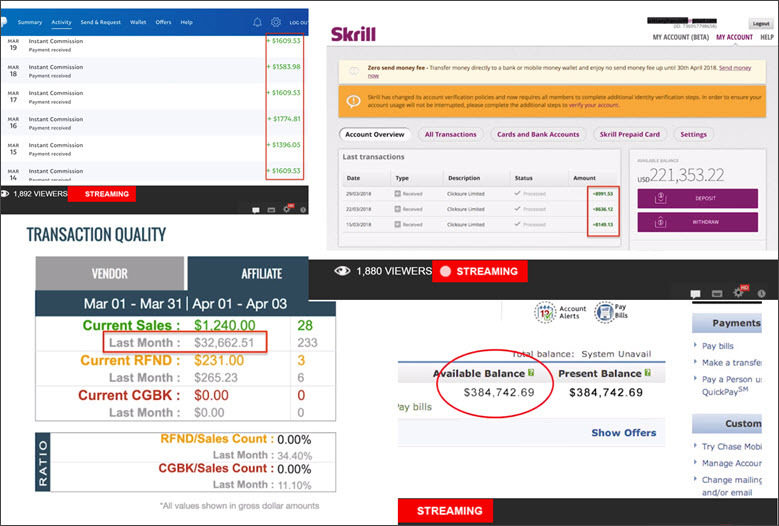 Inside the member’s dashboard, I found 4 types of training that claims to help you make $30k a month. With 3 years experience running online business and 10 years experience running small marketing agency, other than email marketing, none of the other methods inside 60 Minute Profit Plan is able to help you earn $30k a month. That's also provided if you have a huge subscriber list. I don’t think there’s a need to explain about the 4 methods here as you can easily find them inside my blog article on Real Ways To Earn Money Online. Come-on, doing online surveys, website testing and freelancing jobs will only add up to earning less than a few thousands a month. Unless you have unique skill that others don’t have but highly sought after in the market, otherwise it is almost impossible to even earn up to $5k, let alone $30k as claimed inside 60 Minute Profit Plan. Having said that, despite email marketing is the most potential training inside 60 Minute Profit Plan, the content provided can easily be found anywhere on the web for free. Just follow any online marketing influencer, or private message me inside my community, and you can find get all the solutions to email marketing. You don’t even have to pay me anything! This is an absolute NO! All methods shown inside 60 Minute Profit Plan are only the basic. It is not possible to even make a few hundred dollars with this program let alone the empty promises to make more than $30k a month inside the sales pitch. If anyone reading this happen to achieve $30k a month just by learning from this program, please leave me a comment below and give me a big slap! I’ve been there and done that when first started online marketing. Being new, I was scammed to pay $1,500 for a full package of low quality training content with the promise that I can put up these programs on ClickBank to make a profit. After I purchased the program, I found training content are of low quality with fake owner persona inside sales pages and all email autoresponders. And I naively pay for it hoping that these products sell! Of course I didn’t make any sale at all. I can tell you 60 Minute Profit Plan is something very similar to what I bought. The way it promotes its sales page, get fake testimonials, fake owners, and even selling on ClickBank are so similar. When you try to close the browser tab of that 60 Minute Profit Plan sales page, there will be pop up offering you a huge 30% discount. That’s exactly the same method used inside the low quality training package that I bought! 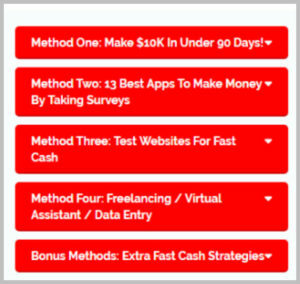 No way 60 Minute Profit Plan can give you $30k a month if you just want to make money by doing paid surveys, testing websites or freelancing. Even the email marketing training provided inside the program is not comprehensive enough for anyone to achieve that. With all the fake actors and fake testimonials exposed by me earlier, what do you think? And what about those low quality training and broken links that lead to YouTube video? If you find it’s worthwhile to pay $37 so you can save some time searching for the training videos that you want, then this amount might be considered as a small fee to engage a researcher. Oh, that’s cheap, but a low quality one is what you get. The problem lies with quality of the training. I won’t pay $37 for some training that is not only low quality but on top of that, can be found easily the web for free. I don’t think any high quality program will have difficulty getting real testimonials. If 60 Minute Profit Plan is so good and can make you more than $30k a month, why are they paying for fake actors and fake testimonials to build their reputation? If you really want to start email marketing, I can confidently recommend you to use Profit Builder to create sales funnel & opt-in page; Aweber for email management & autoresponders; and Sqribble to create professionally designed ebook. I can even show you various ways to drive traffic to your page, all legitimate methods used by successful marketers around the world. Did 60 Minute Profit Plan share this piece of powerful information with you? I am sure by now you should be able to determine whether 60 Minute Profit Plan is scam or legit without me giving you the answers. No, I do NOT recommend 60 Minute Profit Plan. If you ask me, I never believe in anything that can generate quick money. 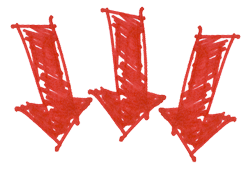 Even if there are such programs, it would most probably workable for a very short term where in the long run, you will end up losing more. Throughout my entire life, I’ve been holding on to the principle of “delayed gratification”. I believe with hard work and patience, success will always be around the corner and the sweetest. Of course, that’s provided you choose the right program that gives you least uncertainty but more control over your own success. And one that provides overview of how the industry works so you are able to make sound decision. 60 Minute Profit Plan only offers 4 types of training inside its dashboard. If you truly understand how online business work, then you will know taking paid survey, testing websites and freelancing are not part of the business. That can only be considered as freelancing jobs. 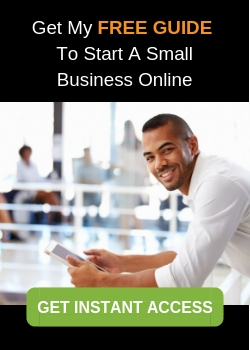 You are not even near to be called running a small business online. 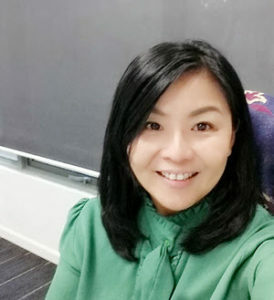 No doubt email marketing is the evergreen marketing strategy for all businesses but the training provided inside 60 Minute Profit Plan is really too low quality that I rather spend my money learning from CB Passive Income 5.0 program. If you are serious to start small business online, which I think you are, then I suggest you to learn from legitimate sources. You can check out my free guide here. Inside, you will see how this online marketing industry works including all the proven marketing strategies applied by successful marketers to build a long-term online business. Just like any other business, online business takes time to build. There’s no short cut at all. If you have any questions or thoughts about whether 60 Minute Profit Plan is Legit, Scam, or anything you want to share, please do not hesitate to leave me a comment below. I love to hear your views! 4 Comments on "The 60 Minute Profit Plan Review (Can You Make $30k as Brittany Francis claims?)" Thank you for pointing out what a SCAM this program really is. I’m so tired of people coming up with these schemes and they tend to target vulnerable demographics with their face single mother, drop out student testimonials. 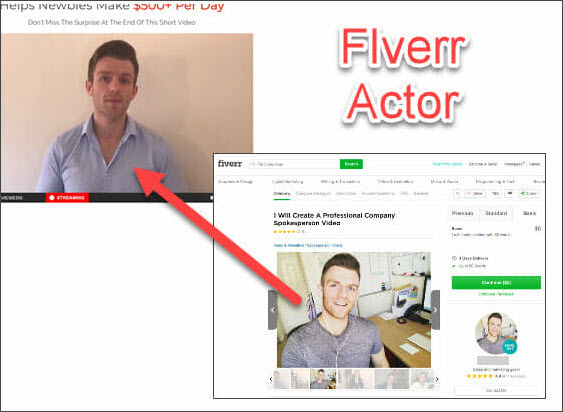 To top it off, the fake founder, stock photos and Fiverr actors. It’s just not right. I hope this post saves someone from falling victim to it. 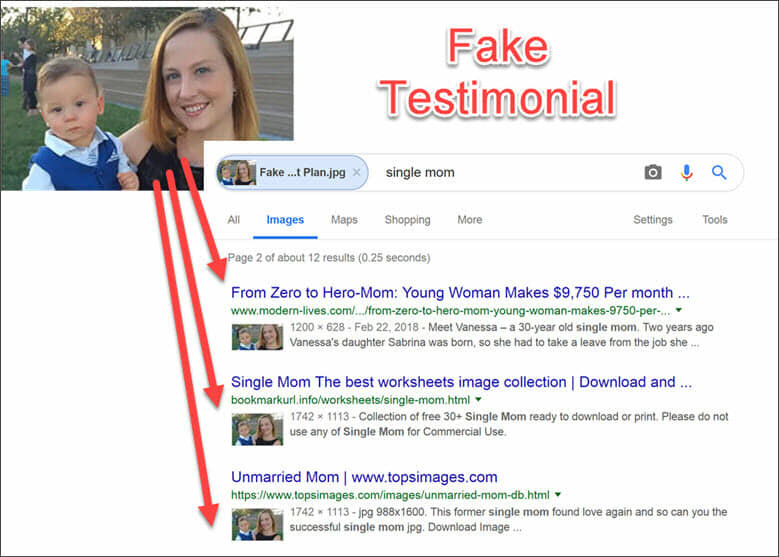 Lol… I also got frustrated when found so many fake testimonials. That’s real unethical method to promote any products. I only believe in white hat marketing strategy. What 60 Minute Profit Plan did is 100% black hat. Hope more people can see this post to prevent making the wrong decision. I planned on getting a plan some months ago to keep me on track with my online business and you make a good point about trusting people who already mislead you to believing one way. Its like I want to give it a try but is it worth it I continuously ask myself. This article helps normalize the suspicion of online products that guarantee you money.